Frazier’s Ergo Deep allows walk-through access to the next aisle for faster case picking. Increase Aisle-To-Aisle Access – FRAZIER’s Ergo Deep takes a low-sitting front shelf beam and splits it into separate curved beams that attach to the rear of the shelf. This allows pickers easier access to the second position while also creating walk-through access to the next aisle for faster case picking. Industry publication Modern Materials Handling stopped by our booth to review the Ergo Deep Solution as part of their Feature on the show. The Ergo Deep is an advantageous solution that allows increased pick locations, better storage utilization, less product damage, decreases in worker’s compensation and measurable improvement to warehouse productivity. Semi-Automated Deep Lane Storage – Also covered by Modern Materials Handling at MODEX, FRAZIER’s Pallet Mole® system measurably increases efficiency over traditional deep lane storage solutions. 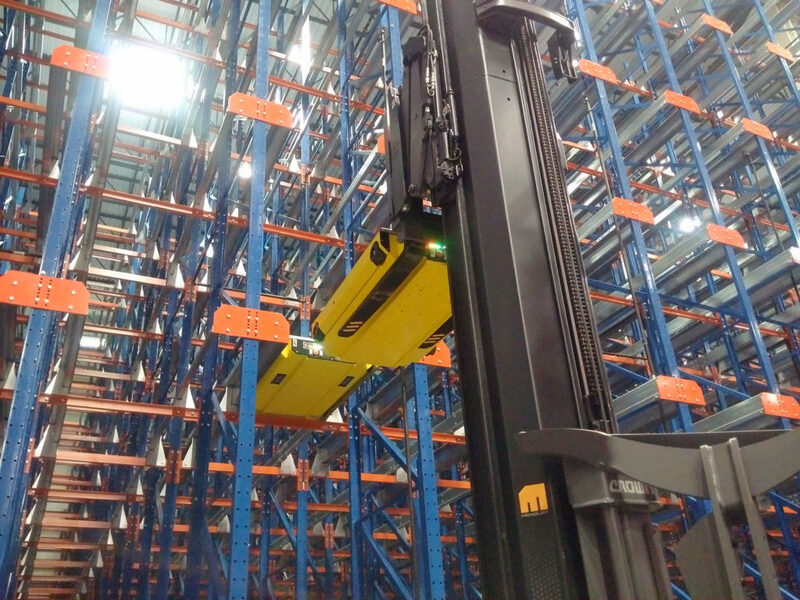 Its features, including the ability to move up to 50 pallets per hour and an industry unique magnetic latching system, make it the system of choice where deep lane storage is required. Click Here to learn three reasons why companies select the Pallet Mole®. A magnetic latching system allows Frazier’s Pallet Mole® to be securely lifted by a fork truck. Storage Solutions for Any Need – Beyond the Ergo Deep and Pallet Mole®, FRAZIER offers Storage Solutions for any need. 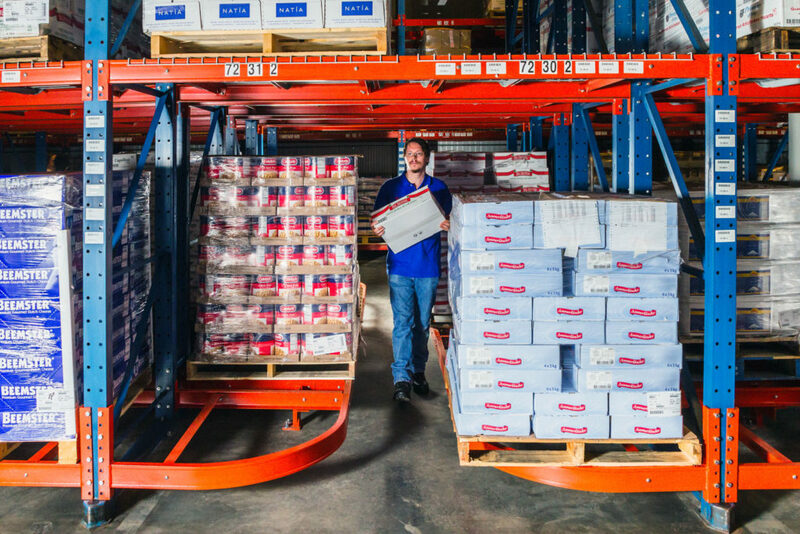 Other popular FRAZIER Solutions include SelecDeck® Case Flow to convert floor level pallet locations into a greater number of pick slots, Glide-In® Push Back for high-density storage with greater selectivity, and More. System Application Design Expertise – Unlike other manufacturers that only fabricate racking, FRAZIER has the ability and experience to work with customers to conceive applications that maximize their storage. President, Carlos Oliver and Director of Engineering, Daniel Clapp displayed this experience through their participation as presenters during the Rack Manufacturers Institute’s MODEX Seminars. Carlos and Daniel tackled “Consideration for the Planning and Use of Industrial Storage Racks” and “Resources and Frequently Asked Questions”, respectively, to spread insight towards best use of racking technology. Unable to attend either seminar at MODEX? Webinars For Both Sessions are available from MHI. As a whole, FRAZIER’s engineering staff boasts dedicated divisions for both Standard Product and AS/RS Engineering, including Professional Engineers registered in 45 states. This affords FRAZIER the ability to design storage applications that increase space utilization, productivity, pallet positions and pick faces. Be sure to join FRAZIER at other upcoming Industry Events, including the Global Cold Chain Expo!